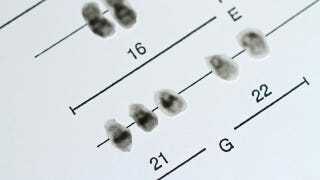 Researchers remove extra chromosome from Down’s syndrome cells. Could a gene therapy be next? Scientists from the University of Washington have successfully removed an extra copy of chromosome 21 in cell cultures belonging to a person with Down's syndrome. While the breakthrough is unlikely to result in an outright treatment for the condition, it could pave the way for gene therapies in which many of the health conditions associated with the chromosomal disorder can be significantly alleviated. Down's syndrome is the result of having three copies of chromosome 21 instead of the usual pair. This results in what's called a trisomy — a genetic anomaly that can often result in altered cellular phenotypes and cogenital abnormalities. Extra chromosomes account for almost a quarter of all spontaneous miscarriages, along with conditions like Edwards syndrome and Patau syndrome. But of all trisomies, it's Down's syndrome that accounts for the majority of live births. As a result of the extra copy of chromosome 21, individuals with Down's syndrome feature characteristic eye, facial, and hand features, as well as a number of medical problems like heart defects, impaired intellect, premature aging and dementia, and certain forms of leukemia. But now, Li B. Li of the UW Department of Medicine, along with David Russell and Thalia Papayannopoulou, have developed a technique in which they were able to correct trisomy 21 in human cell lines grown in the lab. And they were able to accomplish this by using, what else, pluripotent stem cells. And indeed, the researchers got the idea while working with stem cells to develop regenerative therapies — what often results in trisomies. To overcome the problem, they used a specialized virus to deliver a foreign gene called TKNEO into a particular spot on chromosome 21. This spot is within a gene called APP, which is located on the long arm of the chromosome. They chose this specific gene because of the way it responds to positive and negative selection under specific conditions. So, when grown in an environment that selected against TNKEO, the only cells that survived were the ones that spontaneously lost the extra chromosome. This obviously created a desirable selection effect. In addition to this technique, the researchers also employed "point mutations" (single, tiny alterations in DNA base pairs) gene silencing (turning off TKNEO), and the outright deletion of TKNEO. While the researchers don't see their intervention as a way to treat Down's syndrome outright, they have suggested that resultant gene therapies could treat specific aspects of the condition. For example, they could create cell therapies for some of the blood-forming disorders associated with the disorder. In addition, Down syndrome patients may eventually be able to have stem cells derived from their own cells, and then have the cells corrected in the lab — after which time they could receive a "stem cell transplant" (minus the extra chromosome), or healthy blood cells derived from their fixed stem cells as a part of their cancer treatments. The team is also hopeful that the discovery could lead to potential cognitive therapies as well. The study was published in Cell Stem Cell and can be found here.